ISTANBUL (AP) — Turkish President Recep Tayyip Erdogan made a series of televised appearances overnight in which he disclosed dramatic details of his survival on the night of a failed coup and raised the specter of reintroducing the death penalty to punish conspirators. He told U.S. broadcaster CNN he narrowly escaped death after coup plotters stormed the resort town of Marmaris where he was vacationing. “Had I stayed 10, 15 additional minutes, I would have been killed or I would have been taken,” he said in the interview broadcast late Monday. Turkey’s state-run news agency says courts have ordered 85 generals and admirals jailed pending trial over their roles in the failed coup attempt. Dozens of others were still being questioned. Anadolu Agency said Tuesday those formally arrested include former air force commander Gen. Akin Ozturk, alleged to be the ringleader of the July 15 uprising, and Gen. Adem Hududi, commander of Turkey’s 2nd Army, which is in charge of countering possible threats to Turkey from Syria, Iran and Iraq. Ozturk has denied the allegation, saying he neither planned nor directed the coup, according to the Anadolu Agency. Authorities have rounded up thousands said to have been involved in the coup, which killed 208 government supporters and 24 coup plotters. The government maintains that Fethullah Gulen, a U.S.-based Muslim cleric, was behind the coup, and has vociferously demanded his extradition. Thousands of officials suspected of links to Gulen were purged from the judiciary and the Interior Ministry. “No democracy shall allow for soldiers, prosecutors, police, judges, and bureaucrats to take orders from an outside organization instead of the institutional bureaucracy,” said Erdogan. The president and other officials have strongly suggested the government is considering reinstating the death penalty, a practice abolished in 2004 as part of Turkey’s bid to join the European Union. “In a country where our youths are killed with tanks and bombs, if we stay silent, as political people we will be held responsible in the afterlife,” Erdogan said, pointing out that capital punishment exists in several countries around the world, including the United States and China. Speaking to parliament, the chairman of the opposition Nationalist Movement Party, Devlet Bahceli, said his party would back legislation to reintroduce the death penalty if it was put forward by the ruling Justice and Development Party, or AKP. “If the AKP is ready, we are in for the death penalty,” Bahceli said. Prime Minister Binali Yildirim, meanwhile, reflected the triumphant mood of authorities. 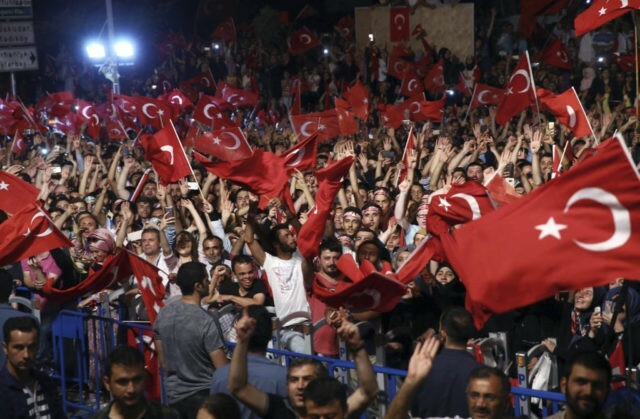 He said the July 15 victory over the plotters was “epic” and that no coup in the history of Turkey had been as brutal as the one that the elected government survived. “The force of the tanks could not beat the force of the people,” he said. Yildirim said Turkey has sent four files to the United States on Gulen, who denies any involvement and has condemned the coup attempt. Yildirim also lashed out at Europe, whose leaders have expressed concerns over the purges underway across Turkey’s key state institutions. “We thank our European friends for their support against the coup, however their sentences starting with ‘but’ did not please us at all,” he said. Fraser reported in Ankara. Sarah El Deeb and Cinar Kiper in Istanbul also contributed reporting.